A week of fun activities began in the city centre at the weekend for the start of the Peterborough Green Festival. The city’s eco-friendly credentials were put on display for the festival launch with events taking place in Cathedral Square, St John’s Square and Cowgate. Cycle-powered activities, art exhibitions, rides, live performances and interactive stalls all featured on Saturday (May 23). The Green Festival is run by the Peterborough Environment City Trust and is a free event for all residents and visitors to the city. This year’s festival will be based on the theme of sustainable transport. Fringe events are also taking place across the city, including Sunday’s cycle-powered performance of the Lego Movie at Allenvale Lake in Hampton. Peterborough Wildlife Festival is your chance to explore the great outdoors and discover your local wildlife. You can join free bird walks, bat evenings, pond-dipping, bug hunts and fun craft activities. 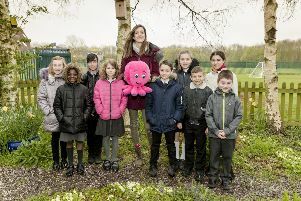 By Nene Park Trust, Froglife, the Wildlife Trust and Buglife, with financial support from the Big Lottery Fund. For more information visit www.neneparktrust.org.uk. Download a sponsor pack and ride one of two routes to raise money for The Green Backyard – The whole 45 miles of the Green Wheel or a 7-mile fun ride to Nene Park. If you would like some company, a group will be leaving The Green Backyard at 10.30am on Sunday 24 to ride the longer route. Download maps and sponsorship information at www.thegreenbackyard.com/resources. Take a walk on the wild side at Sacrewell in May half-term. Join in with pond dipping, a mammal safari and really ‘wild’ events taking place throughout the week. Normal admission prices apply. Come and experience the real Latin vibe! Join in the line-up and freestyle sessions, have a drink and relax while watching the classes. There will be the chance to discover how to improve your health through active salsa. Free event. Join the Green Festival lunchtime community litter pick, which will head along the riverside from Perkins in Fengate through to Showcase Cinemas, meeting at the North End of Sainsbury car park. This event is supported by IKEA and run in partnership by the charity Peterborough Environment City Trust, Amey and RiverCare. If you would like more information about getting involved, please email Tim Devonshire on mrtdevonshire@gmail.com. This group is for local vegetarian and vegans and other like-minded people to get together to share some good food, recipes and advice for healthy eating and local sustainably-sourced food. Bring your own food to share. By the Peterborough Vegan and Vegetarian Society. Free event. Steam Past to a Brighter Future! Enjoy a fully guided 90min entertaining tour of Railworld and the Wildlife Haven. There will be a nostalgic slide presentation on Peterborough in the 1950s/1960s, when steam trains ruled the railways! £1 per person, children free. The winner of the Green Awards 2015 for Best Sustainable Food Producer. Come and see how Riverford grow, harvest and pack the organic veg, with a tour of the farm and packhouse, followed by a small taster of their organic veg. Please wear suitable outdoor footwear. Due to the terrain of the walk, not recommended for young children, the elderly and wheelchairs. Spaces are limited and booking is essential. To book please call 01780 781 665. £5 per person. A guided walk exploring the geology of Swaddywell Pit and its link to the local industry, culture, landscape and wildlife. Refreshments will be available. Not suitable for wheelchairs or buggies. By the Langdyke Countryside Trust and GeoPeterborough. £3 (school age children free). Do you love fashion but hate trawling the shops? Is your wardrobe bulging with clothes you haven’t worn in years? We’ve got the guilt-free solution to a new wardrobe that won’t break the bank. Simply bring at least one clothing item to swap, and then take home up to the same amount of items you bring. Refreshments available. £3 entry fee. Visit www.pect.org.uk. Join in the Environment Capital Film Night, with ‘Who killed the electric car?’a documentary that explores the electric car industry in the USA. £3 suggested donation (donations to be split equally between The Green Backyard and Railworld). Drinks and nibbles will be provided. The film will be followed by a panel discussion. By The Green Backyard, supported by PECT and Peterborough City Council. Sponsored by TravelChoice. Discover what goes on at a real farm on the outskirts of Peterborough. Walk through the fields, feed the lambs, join a tractor and trailor ride and see how your food is grown. There will be a quiz for children and the option to purchase a homemade sausage sandwich afterwards. Free event. Come along for lots of free children’s activities, a chance to find out how you could get involved in caring for the local wildlife and win the opportunity of being ‘a ranger for the day’. There will be bugs to discover, birds to spot and opportunities to join in pond dipping and more. Free event. By Nene Park Trust, Froglife, the Wildlife Trust and Buglife, with financial support from the Big Lottery Fund. For more information visit www.neneparktrust.org.uk. Craft your own handmade gift! Have a go at making your own little felt item with national artisan felter Eve Marshall. She says that ‘It all begins with a bit of fluff’, we say ‘It all ends with a lovely memento.’ Suitable for all ages and abilities. £1 or £2. The Fun Family Skate has all the latest with a resident DJ taking your special requests. A fun way to stay active! Skate hire is available in sizes jnr 8 – adult 12 (£1.50) or you can bring your own. Admission is £3.50, with a family ticket for four just £11 (children skating must be at least 3 years old). Visit www.vivacity-peterborough.org.uk. Catch Bus X4 at 12.04. From there enjoy a light Warmington walk through the villages between here and Oundle alongside the River Nene, then into a coffee shop in Oundle. We aim to be back in Peterborough by 3.45pm. Free for bus pass holders, around £6.20 for non-pass holders. By the Peterborough Ramblers. Come along to the ultimate bring-and-share community picnic. Bring a dish and add it to the feast! You can also enter the Soup-Off, a competition to find Peterborough’s best soup maker. Judging starts at 1pm. Entrance is free if you bring a dish or donations welcome if you don’t.